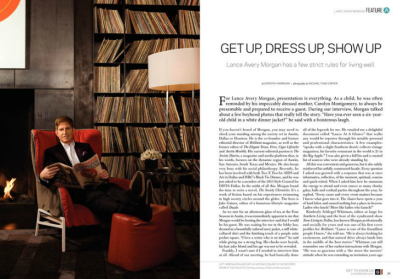 LANCE AVERY MORGAN ON "L STYLE G STYLE"
Our very own Lance Avery Morgan, who has overseen (and written) hundreds of cover stories and features in his time has had the tables turned on him. 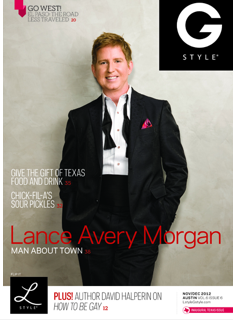 Now HE is this month’s cover guy on the Texas-wide story, "Get Up Dress Up Show Up" expertly written by Dorothy Harrigan, daughter of author Stephen Harrigan, (The Gates of the Alamo, Remember Ben Clayton) in L Style G Style magazine. The magazine, owned and helmed by Alisa Weldon and Lynn Yeldell, is a slick pub that has gained a fan base in the Austin area with the artful crowd. Neiman Marcus dressed Morgan for the magazine’s cover shot, photographed by Michael Thad Martin, the magazine’s top shooter. It was all done at the newish W Austin hotel. From black tie to velvet sport coats to suits, the stores best of the best was utilized to tell a story of both the current season of fashion and to complement Morgan’s own fashionable viewpoint as the editor in chief of The Society Diaries magazine, Brilliantmagazine.com and the author of The Society Chronicles (www.societychronicles.com). Look for an issue on newsstands or in a boutique near you or you can access the story and photos online at www.lstylegstyle.com.